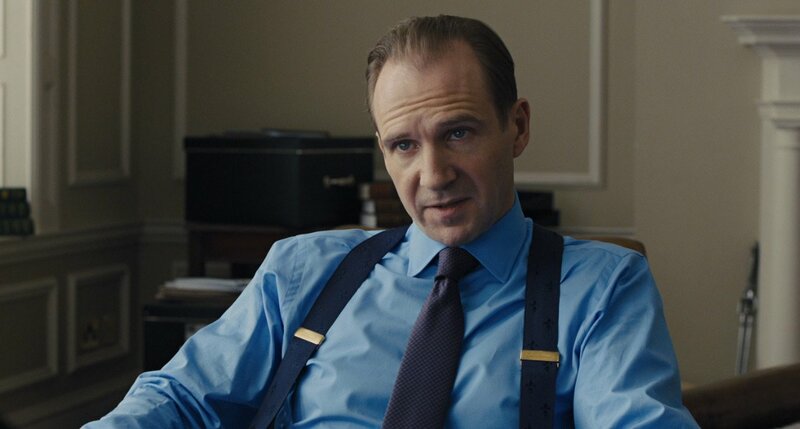 To contrast Daniel Craig’s fashionably-cut suits in Skyfall, Ralph Fiennes’s character Gareth Mallory wears four timeless suits made by modern tailor Timothy Everest. They have a trim, modern cut, but overall the suits have classic proportions with a jacket length that covers the rear and medium-width lapels. In a brief scene where M visits Mallory in his office, he is seen in dark grey suit trousers without his suit jacket. We know the trousers are part of a suit because the suit jacket can be seen draped over a chair. The suit jacket is single-breasted and cut with straight, padded shoulders in the Savile Row tradition. Unlike on the blue chalk stripe suit that Mallory wears later in the film, this suit jacket has straight, flapped pockets and no ticket pocket. It has a single vent that is roughly 10 inches deep. It’s a shame that this suit jacket plays an extra in the scene instead of getting the leading role it deserves. Since Mallory has a high government position and is in his own office, he can appropriately leave his jacket off whilst meeting with M. However, the suit jacket would be better cared for on a hanger in the closet. Mallory must have a better place to keep his jacket. Hanging the jacket on the back of a chair is not a healthy way to take care of a meticulously-shaped bespoke suit jacket. However, if the suit jacket was stuck in a closet we wouldn’t even get a glimpse of it apart from the little of it that is seen in the psychologist scene. 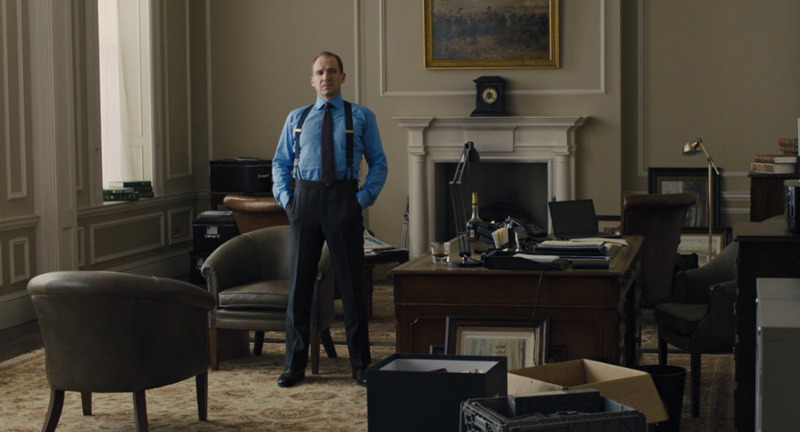 Part of the film’s budget went to Mallory’s bespoke suits, after all, and by keeping the suit jacket in the back of the shot they make use of it. The same is done with his charcoal pinstripe suit jacket later in the film. The trousers, for once, have the starring role of all the clothes in this scene. They have a flat front and single rear darts on either side. The trousers sit high at the waist, and they don’t need pleats to do so, though they look a little tight around the hips. The waistband has a long extension—to keep the front straight—and slide-buckle side adjusters. The trousers have slanted side pockets and a button-through jetted pocket on the right in the rear. The legs have a trim and tapered cut, but they aren’t tight like on Daniel Craig’s suits. Mallory uses braces—known as suspenders to some Americans—to hold up his trousers, though he also uses the trousers’ side adjusters to keep the waistband close to the waist. The braces attach inside the waistband at the front and on extended tabs in the rear. The extension tabs allow the braces to sit higher like they would on the old-fasioned fishtail braces back, making the braces more comfortable. The tabs can be tucked inside the trousers if Mallory only wanted to use the side adjusters to hold up his trousers. Braces, however, are by far the most secure method of holding up the trousers. Mallory’s braces are navy with a navy embroidered fleur-de-lis braces motif and were made by Albert Thurston. The braces have black leather ends and trimmings—which most likely match Mallory’s unseen shoes—and brass levers. Braces set Mallory apart as an old-fashioned man, but they also mean that he is a man who wants to get the job done the right way and doesn’t settle for nonsense—or belts. Mallory’s cotton poplin shirt is a deep sky blue, which slightly overpowers his light, cool, low-contrast summer complexion. The shirt has a moderate spread collar, double cuffs attached to the sleeve with pleats, and a narrow English-style placket that is stitched 3/8 inch from the edge. Mallory’s tie is navy with a raised woven purple lattice diagonally across the tie. Mallory ties it in a four-in-hand knot. I think the suits Tim made are easily the best in the whole film. And, it’s a small pedantic point, but Tim is not a Savile Row tailor. He is based in the East End of London, just next to the City. Thank you. I was mistaken. Earlier this week I watched Skyfall once again (I’ve seen each Bond film at least 10 times 😉 and I found Gareth Mallory’s suits much better than those of 007. 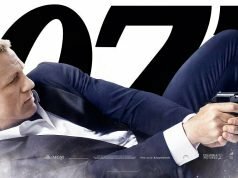 My idea is that Bond looks a bit boyish even in case he’s considered ‘getting old’ in that film — that’s why he might not have choosen tweeds for final battle. Mallory supposedly isn’t much elder than 007 but he looks well in the suits appropriate for his position and age. I’m aware something of “marketing” may be involved in this visualisation. 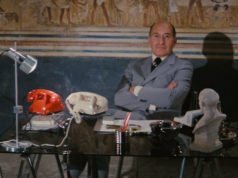 After all Bond’s duty is to praise the look that younger men could follow, hence his ‘hipster’ suits and Barbour jackets — but nobody needs Mallory to be appealing. In the first picture of Fiennes the rise of the pants is interesting. My default assumption is that unless someone has some odd proportions that they are trying to mask, then the top of the pants should end not too far past the halfway point of the body. I must admit that I don’t why why I think this, as I don’t recall reading it anywhere. But it makes me think that if the waistband was a couple of inches lower then the pants would look more balanced on Fiennes. What is the halfway point you are talking about? The crotch is roughly halfway between the neck and the feet. If the halfway point you mean is between the head and the feet, the trousers would have a 6-inch hipster rise. The trouser waist is supposed to coincide with the body’s waist and the fastening jacket button, and Fiennes’ trousers do that. If the trousers were lower the shirt and tie would show below the jacket’s button. …or I do work in the environment of slim-legged trousers and narrow-lapel blazers — the outfits that hipsters wear when they turn bloody business consultants. Fiennes suits are damn-near perfect in Skyfall. The rise on the trousers looks great. It doesn’t seem to be to be as high as on some of Connery’s trousers, but I may be wrong about that. I hope we see more suits like this on him in the next film. Something tells me it’s our only hope to see great tailoring. In my next suit i have ask for braces with buttons inside the trousers. Trousers (with one reverse pleat) will be also belt loops for use with only the belt. Yes,i know,side adjuster are more clean..but Italian talors not made side adjuster. Seeing Skyfall after reading so much of this blog got me thinking about the roles that even subtle differences in costuming make. Done properly, these details say so much about the characters and the story — in this case, their backgrounds and personalities. Matt, I always like the look at the ancillary characters and their contrast with Bond. Mallory’s suits are great and without question the best in the film, however, these trousers look a little like they are being forced up a little bit higher than they should be as if they are medium rise that have been pulled up to look high rised. On the front we can practically see which way he dresses and from the back we clearly see every nuance of his bottom. I take it back. I realise that the trousers are fine. Beautifully cut trousers! I think this is how slim/tapered trousers should really be cut. The shot from the front really shows that they are tapered yet still drape properly. Matt, how much tapering do you think is done on these trousers? I mean, the ratio between the thighs with the leg opening? I have a pair of trousers with 26″ at the top of the thighs and 17.5″ leg opening. Do you think this is too much? I would suggest it’s based on several factors such as thigh and calf size and also shoes size. My trousers are roughly 25″ at the thigh and taper down to 16″ opening. And my shoes are uk 8 which means that they trousers only cover 1-2 eyelets (of oxfords) and I think they look great. It gives them more shape when they’re tapered I feel as opposed to the straight up and down of straight leg cut. Ryan gives good advice. I have double-forward-pleat trousers with a 26″ thigh that tapers to a 17″ leg, and they look great. Ryan’s trousers have the same amount of taper, and Mallory’s taper may be somewhere around what my trousers or Ryan’s are. Your trousers certainly don’t taper too much. I know you weren’t asking me but wanted to share my thoughts. Ryan, thanks for the info. I usually wear straight cut trousers so this is my first tapered pair. I wanted them to fit well but still drape properly. As it is now, it’s not snagging on my thighs or calves when I’m standing. But the leg opening sometimes stick to my OTC socks when I get up after sitting down. I wear a size 42 Euro so probably about size 7.5 or 8 UK, right? Very impressive. Wonder if Mr Everest had to convince Fiennes that the braces are not silly or “old-mannish”. Probably not, as Fiennes wore braces with some very nice 1940s suits in The End Of The Affair (1999). And, as was said of Connery’s early 60s trousers, a bespoke tailor plans for the top of the trouser line to be covered by a fastened jacket, and works to the true waist. Mallory really does look like M should in these top-line suits. Matt , I’m curious … Why do the trousers have side adjusters if Mallory only ever wears them with braces ? Do the side adjusters serve a purpose ? I have two bespoke suits from Henry Poole and both of them are cut only for braces. No, side adjusters don’t serve a purpose if one is wearing braces. They’re there for options. That’s why Mallory’s trousers have tabs for braces instead of a fishtail back, because braces are the only way to wear trousers with a fishtail back. Is it a trick of camera angle (top picture) that it looks like the front fastening points of the braces are very uneven? Would there be a reason to make it so asymmetrical? I think it’s just a trick of the camera angle. Though his head is looking straight-on, his body is angled to the side a little. They look to be placed evenly in relation to the trouser creases. Braces should be placed symmetrically, unless someone has an uneven body. Your description of Mr. Fiennes’ outfit in this scene is all comprehensive, as usual. I must say that i a really like this outfit as a whole, the navy suit with the azure blue shirt and the purplish tie. I’d say its a shame they didn’t dress Mr. Craig’s Bond in that way. It is classic, timeless, formally austere and still adds a dash of color to the outfit. 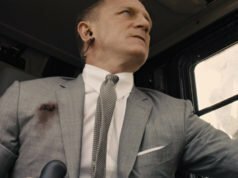 If you remember that brief scene in Skyfall, where Mr. Fiennes is conversing with Ms. Dench about there being no more shadows & the future of MI6, upon the demise of one of their agents whose cover was blown by Silva, you would recollect that Mr. Fiennes was bearing a three-piece suit, although sans the jacket. I liked that outfit too. Is it the same as the one you covered here? Or is it different? In the latter case, i was wondering if you could do an article on that too. That is a different suit than this one. I will look into writing about it.